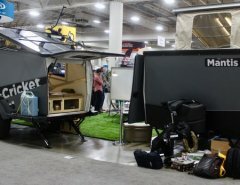 Should I Buy A Tiny House Or A Quality RV? Are you thinking about whether you should be buying a tiny house or a quality RV? Which is better value for money and has greater comfort and other benefits? This article might help you make an informed decision regarding your purchase! 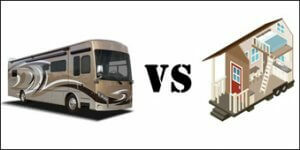 The best way to decide whether to buy a tiny house or invest in a quality RV is to make a list of their pros and cons and do a detailed comparison. 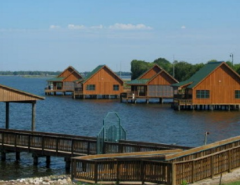 Let’s begin by first looking at the main advantages and disadvantages of buying a tiny house. Stick-built home-like look and feel. Easy to move to another location (normally). Sometimes, the house can be custom designed and built to your taste and preferences. A tiny house could weigh a lot more when compared to an RV. Hence, it might be difficult and expensive to tow. Most custom tiny houses aren’t engineered for the road, and could have major balance issues – making for very tense, uncomfortable driving conditions. These houses aren’t very aerodynamic and definitely not suitable for those who wish to travel extensively. Although many tiny houses are movable, they are also semi-permanent, which means it will take a lot of work to move from one location to another. It could be hard to find a proper parking place where you can actually live for a while. A tiny home can get a lot of unnecessary attention when seen on a road. The most obvious advantage of an RV over a tiny house is its mobility. It allows you to live anywhere you like; close to the ocean, in the mountains or even the desert. Modern RVs are equipped with all kinds of utility hookups and containment features for your comfort and convenience. They usually have all the latest equipment as well as luxury appointments. RVs are built to move. So if you like moving frequently, then a lightweight, aerodynamic RV is ideal for you. 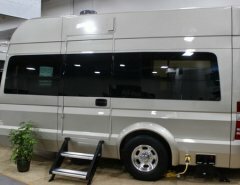 As compared to a tiny house, an RV easily blends in on the road with other vehicles. Hence, it does not attract any additional attention from the onlookers, which can make your trip a bit more relaxing. The outside of an RV is made to be aerodynamic, so it’s not going to look like a tiny house. Can be expensive to custom design and build an RV (however, we offer a wide variety of affordable floor plans, which are Made to Fit). Remember, it’s the little things that make all houses (regardless if they are traditional, tiny, or a motor coach) feel like home. Your custom touches and additions are what are going to make you love your coach, no matter what you decide to live in. We hope that you consider these pros and cons for a tiny house and an RV when making a final decision about your purchase.